I love making fresh Basil Pesto! I figured out an easy trick so both you and I can always have pesto available whenever needed for a recipe. I simply make a big batch of pesto, spoon it into ice trays and freeze it. 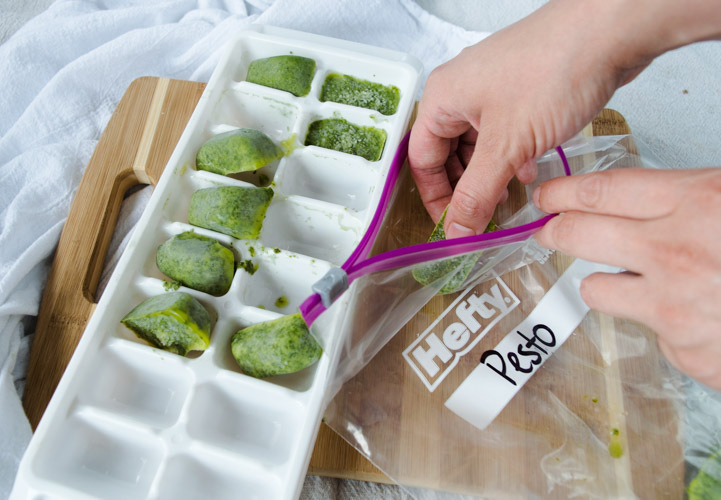 Once frozen, I remove the pesto cubes from the tray and transfer them into a big Ziploc bag and keep in my freezer. When I need a little bit of pesto, I just grab a cube and add to my pasta, sandwich, chicken dish, you name it! Instant basil pesto sauce. 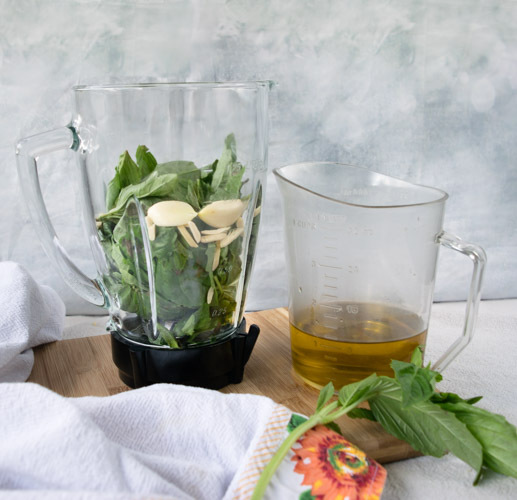 Classic pesto usually consists of basil leaves, garlic, toasted pine nuts, olive oil and parmesan or pecorino cheese (or a blend of those two). 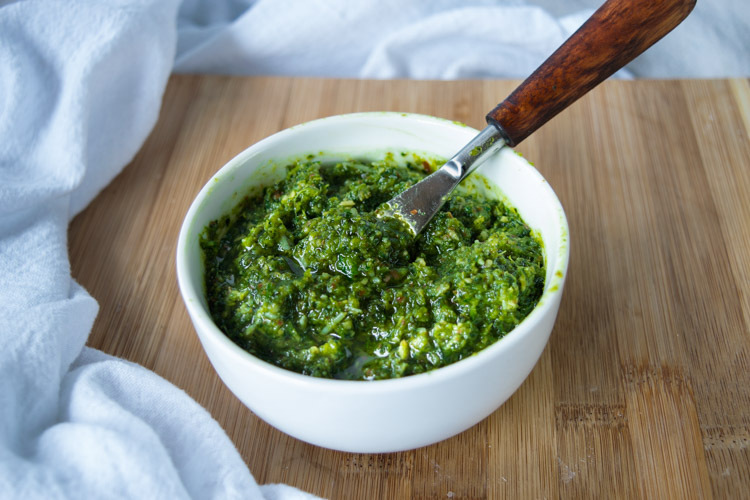 This pesto sauce is so versatile and I am excited to help you get creative and play around with making different kinds of pesto simply by adjusting a few ingredients perfectly to your liking and curiosity. I say curiosity because I am always curious how recipes with turn out with tweaks of ingredients. I also share an easy recipe where you can follow exactly or change up the ingredients if you’re like me and want to experiment. Let’s start with the leaves. Basil is obviously the main character in any pesto sauce. BUT that doesn’t mean you can’t experiment with adding other leaves. I like to add arugula, even spinach or kale which are nice dark green leaves you could mix with the basil to make your sauce. I usually tend to go 50/50 or 60/40 basil/other green leaves. Another nice alternative is garlic scapes pesto. If you’ve never had garlic scapes, you should definitely make a mental note to grab some next summer when you see them at the grocery store or at the farmer’s market. They are the flower bud of the garlic plant and they look like long firm scallions which curl at the top. They taste like mild garlic and are phenomenal in pesto. I usually use about 2 medium scapes per recipe plus the basil. If I am using the garlic scapes, I skip the garlic itself. One of THE best pesto dishes I’ve ever tasted was made with cashews. The chef made a thick, hearty sourdough garlic toast, topped with cashew pesto, slices of prosciutto, big chunks of fresh mozzarella topped with 2 poached eggs. When I first saw this on the menu, I could not stop reading since I was sure my eyes were lying to me. When my plate arrived, I just about died. AND I am being just as dramatic as that dish was delicious! It was unforgettable. Pesto is usually made with toasted pine nuts. You can use almost any nut here. I mainly stick to cashew, pine nuts or almonds. Almonds are my go-to nut since pine nuts tend to be a bit pricey and I tend to make a lot of pesto. I do splurge and make it with pine nuts every now and then. Make sure to toast slightly whatever nut you are going to use, either in a non stick pan over medium-low heat, swirling the pan around to toast evenly, for about 8 minutes. Or in a pre-heated 300ºF oven, spread the nuts in a baking sheet lined with silicon mat or parchment paper and toast for 10 minutes or so, stirring halfway and checking so they don’t burn. When they start to get golden brown, remove from heat or oven. NOW about the olive oil. Try to use some good quality pure olive oil, since it’s such a strong component of this recipe. Look for brands that are guaranteed to provide you with pure olive oil. A lot of brands will add cheap oils such as soy oil or other lower quality ones to lower their costs. Do some research about brands of olive oil. I always have two types of olive oil in my house. The good pure kind (usually more expensive) which I use in dishes required for the olive oil to shine. And my second choice is a bottle of cheaper olive oil for cooking or splashing in a pan before searing a chicken. Take time to educate yourself on what you are buying and using to cook your food. For pesto, you want to use the GOOD kind of olive oil. I recommend California Olive Ranch, it’s not absurdly expensive and it’s a very good brand. A good article to read on olive oils is this one on Popsugar. 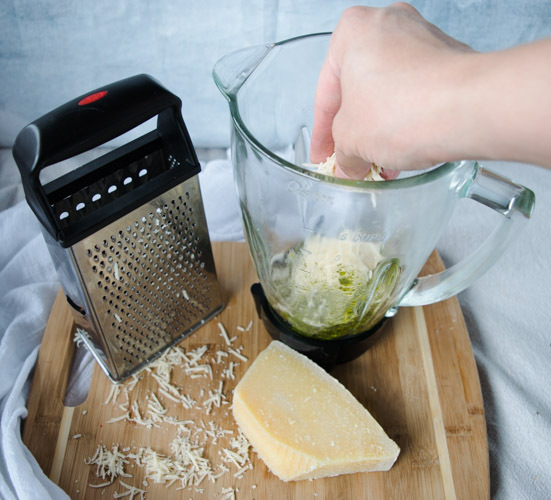 You can use just one or a blend of the following cheeses: pecorino, parmigiano-reggiano, asiago or romano. Go with your instincts and your preferences (or whatever is leftover in your fridge, which is my case most of the time). 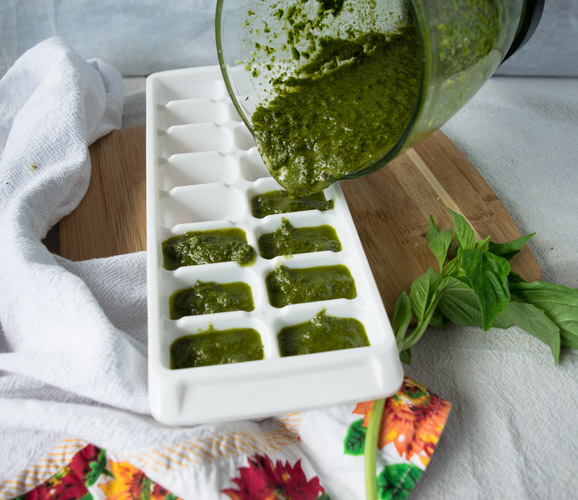 I like to make a big batch of pesto and pour into an ice tray and freeze. Once frozen, I remove the cubes and put them in a ziplock bag. This way, anytime I want to add a touch of basil to my pasta, sandwich or pizza, I just grab a cube that’s already portioned for easy use! 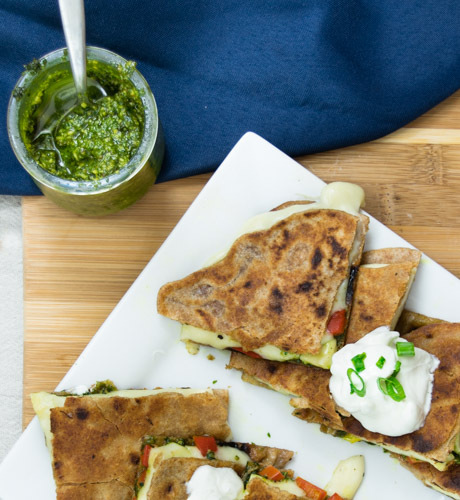 Let us know how you like your pesto and about your pesto experiments! 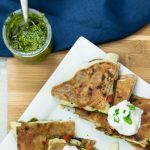 I hope this inspired another pesto lover, such as myself, around the world! Add basil leaves, garlic, roasted almonds, ¼ cup of olive oil, salt and pepper to a blender. Blend to combine all ingredients. Once it has become a paste, start adding the remaining 1 cup of olive oil slowly in a stream, with the blender running. Once all the oil has been added, add the cheese and stir to combine and taste to adjust the salt.